1. Remove the outer "palm sized" small starter cover (already removed). 3. 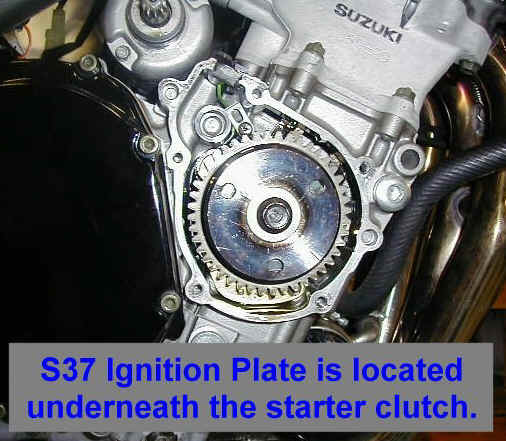 Remove the starter clutch bolt with a 14mm air wrench (that's the easiest and quickest way). 5. With a flatbladed screwdriver, remove the ignition trigger coil from the original mounting plate and reinstall it onto the new Factory Pro ignition plate. Be careful NOT to stab yourself with the screwdriver! If the center core is below the off-white surrounding area, the voltage produced will detrimentally affect the ignition system and make the engine difficult or impossible to start. 6. 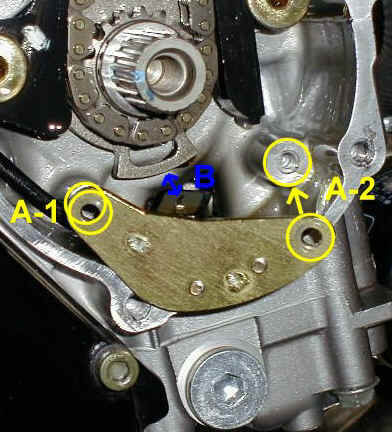 After installing the trigger coil to the ignition plate, temporarily reinstall the starter clutch and bolt and rotate the engine so that rotor projection at B, up arrow is aligned with the trigger coil (so you can measure the trigger coil clearance). 7. Install A-1phillips screw, snug. Install A-2 Phillips screw and snug down. 8. Measure the clearance at B. It should be .015" to .020". Adjust by loosening A-1 and A-2 and pushing the plate towards the rotor. Tighten screws when done. 1. .040" pickup coil to ignition rotor clearance will make the engine difficult or impossible to start. It's OK - just put the 2 pieces together and retighten the 2 flat bladed screws. Lucky you! 9. Check the tightness of the coil plate screws, reinstall the ignition plate. Use a bit of light strength thread locking compound on the screws if you want, for a good job. 11. Reinstall the covers (don't forget the screw under the small cover). Replace or reseal gaskets as necessary. 12. You should not have any parts left over, except for the old ignition plate. True Rear Wheel HP measurement on the EC997!